Home » Ford introduces twin-turbo EcoBoost Ford Mustang Cobra Jet Concept at 2012 SEMA. 2015 preview? Ford introduces twin-turbo EcoBoost Ford Mustang Cobra Jet Concept at 2012 SEMA. 2015 preview? For drag racing (and strictly off-road use only), Ford introduced a twin-turbo 5 liter V-8 powered Cobra Jet Mustang Concept at SEMA in 2012. The engine uses EcoBoost technologies with twin ball-bearing turbochargers. Power and torque were not specified. A question on the net is whether this is a prototype of an engine for a future S550 Mustang. 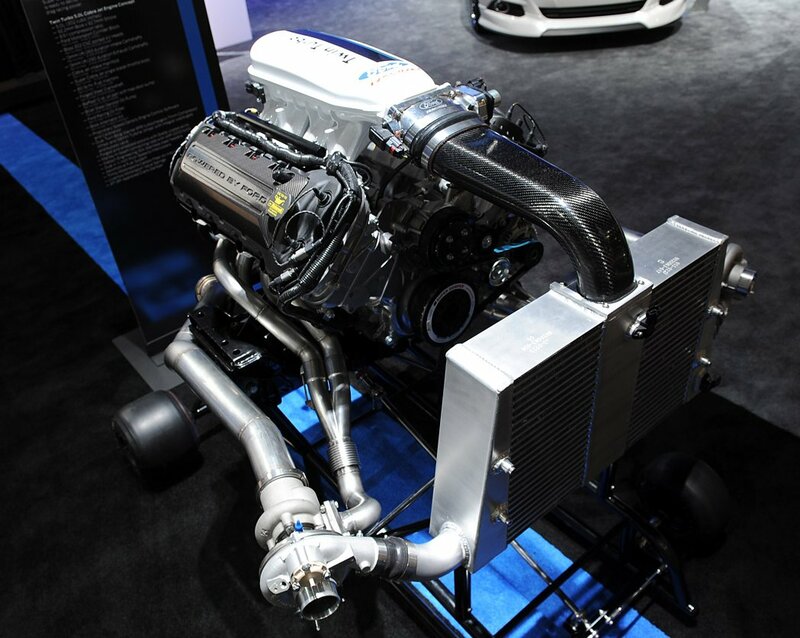 Unfortunately, per the SEMA picture below, the engine will not fit conventionally into a street Mustang’s engine compartment: the placement of the turbos and intercooler are totally wrong. How this engine could be used in a future Mustang is up in the air. The turbos would have to be drawn up much closer to the engine. But then the fuse box would be directly on top of the left turbo, and the air intake on the right. That wouldn’t meet production standards, so the use of this engine as it is designed is impossible. LAS VEGAS, Oct. 30, 2012 – The Ford Racing Mustang Cobra Jet concept revealed today at the Specialty Equipment Market Association (SEMA) show proves there is indeed a replacement for displacement. In the perpetual quest to stay ahead of the competition, for the first time ever Ford Racing has equipped its factory-built turn-key drag racer with a turbocharged engine, adopting the same award-winning technology found on road-going EcoBoost engines. When the original Mustang Cobra Jet drag racers rolled out of the Mustang factory in 1968, they relied on 7.0-liter V8 engines with massive four-barrel carburetors to propel them down the strip. “Racing pre-dates Ford Motor Company. Henry Ford himself raced the 999 and won in 1901 to generate interest for the new company,” said Jamie Allison, director of Ford Racing Technologies. “We haven’t stopped since. “We’ve competed in almost every category of auto racing, from deserts to road courses to ovals and drag strips over the past 111 years, often with cars and trucks based on our production models, including the Mustang,” Allison added. In 2011, the Mustang GT’s all-new 5.0-liter V8 found a home in the Cobra Jet, both with and without a supercharger. 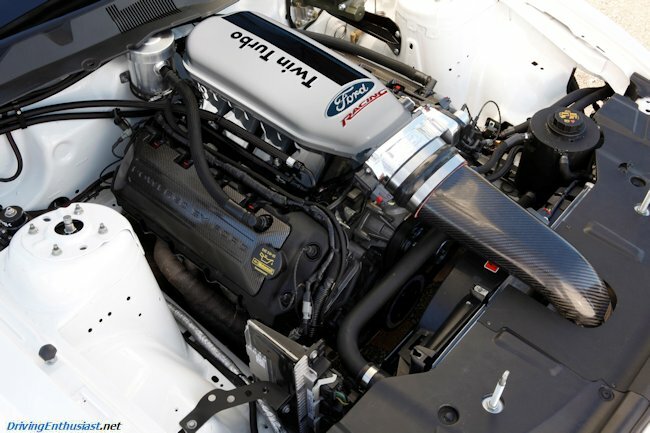 “Despite its smaller displacement, the improved breathing of the 5.0-liter with its twin independent variable camshaft timing and Boss 302 cylinder heads provided comparable performance while showcasing the high technology available in street Mustangs today,” said Rob Deneweth, Cobra Jet powertrain development engineer. While superchargers provide instant on-demand power, they can also sap a lot of power especially at high boost levels. The 2.9-liter blower used on the 2013 Cobra Jet uses as much as 100hp to drive the supercharger.. That’s power no longer available for acceleration. Fortunately, every internal combustion engine has a plentiful source of energy that normally goes to waste right out the exhaust pipe. Turbochargers harness the thermal and kinetic energy in the exhaust gases to drive turbines and compressors that force more air into the engine for a big increase in power without most of the parasitic losses of a supercharger. Turbocharger design and release engineer Dave Born joined the Cobra Jet team after working on the 3.5-liter EcoBoost® V6 for the F-150 to help make this concept a reality. “When done right, turbocharging is just as good as or better than supercharging,” Born confirms. NHRA competition rules for the stock classes Cobra Jet races in require parts like turbochargers to be derived from production components. Borg-Warner™ has supplied smaller, more efficient turbochargers based on the units used in the Focus ST for the Cobra Jet concept. Smaller than those found in most other drag racing applications, the turbine wheels are made from titanium aluminide that reduces the rotational inertia by 50 percent. Along with a shaft riding on low-friction ball bearings, the compressors can spin up to 150,000 rpm almost instantly. The Cobra Jet project car features its own unique take on the new global Ford Racing livery that is also highlighted at SEMA. The white body is accented with an asymmetric black and blue stripe running over the top of the car from bumper to bumper. The Cobra Jet’s flanks blend an upward sweeping version of the stripe with the traditional striking cobra head executed in black with blue accents. Following the SEMA show, Ford Racing engineers including Deneweth and Born will continue to develop both the performance and durability of the twin-turbo Cobra Jet.